We have regular play dates with our neighbours. The kids have recently become quite interested (bordering on obsessed in Thomas’ case) in each others pyjama’s so we thought it would be fun to have a pyjama party. These are really easy to make and you could do them for any theme. 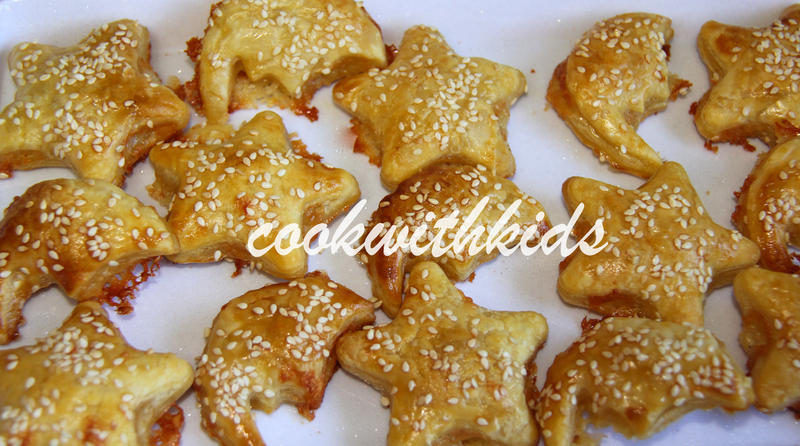 They are just puff pastry cut into shapes of your choice (in this case stars and moons), put some grated cheese on to the star or moon, brush the edges with a slightly beaten egg and place a star or moon on top, push down around the edges, brush top with egg wash, sprinkle with sesame seeds and bake in a moderate oven for approximately 10 mins. These were just too cute. I found them online somewhere and adapted my own version. They are chocolate wafer biscuits – split in half. Melt some white chocolate and allow to harden slightly, dollop some chocolate onto middle of wafer and put an m&m in the middle… Voila! We had a great morning. The kids loved wearing their pj’s for the morning. It was really easy to get ready in the morning too! I think the Mum’s were a bit more excited than the little ones :-). We are going to have some more themed play dates… Have you got any suggestions? Would love to hear them! Ok, I will admit that these didn’t really go down all that well with Thomas. However he didn’t gag on them (which is a sure sign he doesn’t like something). He just didn’t want another one. They are probably a little spicier than he is used to so they might be an acquired taste… They did go down quite well with hubby who has taken them to work with him today. I got the recipe from the Vegie Smugglers Lunchbox ebook. If you’re looking for some great healthy lunchbox ideas this little ebook is great (and it’s only $4.95). You can sign up to receive new posts from the blog also, there’s lots of great ideas. These were very easy to make and would be great for children to make with you. I wanted to test this recipe myself before I got Thomas involved but there is lots of measuring, sprinkling and mixing to be done which I’m sure he would enjoy. The recipe also introduces children to different spices that they might not have been exposed to before. It’s so easy to stick to ‘safe’ foods – ones that you know they will eat but it’s also important to branch out and try new things as well. I encourage Thomas to try new things and explain to him that he shouldn’t say he doesn’t like something if he hasn’t tried it. If he tastes something and doesn’t like it, I don’t force him to eat it but offer it to him again to try again another time. Research shows that children children will reject new foods up to 15 times before they will eat and enjoy it. Persistence pays off! Rince and drain the chickpeas. Remove any loose skins. Leave them to dry or dry on paper towel. 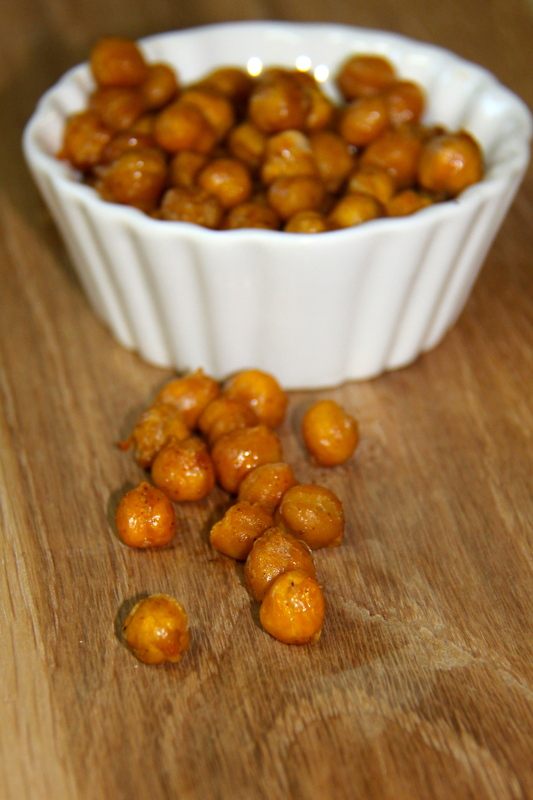 In a small bowl, combine olive oil and spices, mix until chickpeas are completely covered. Bake for 20-25 minutes until slightly crunchy. 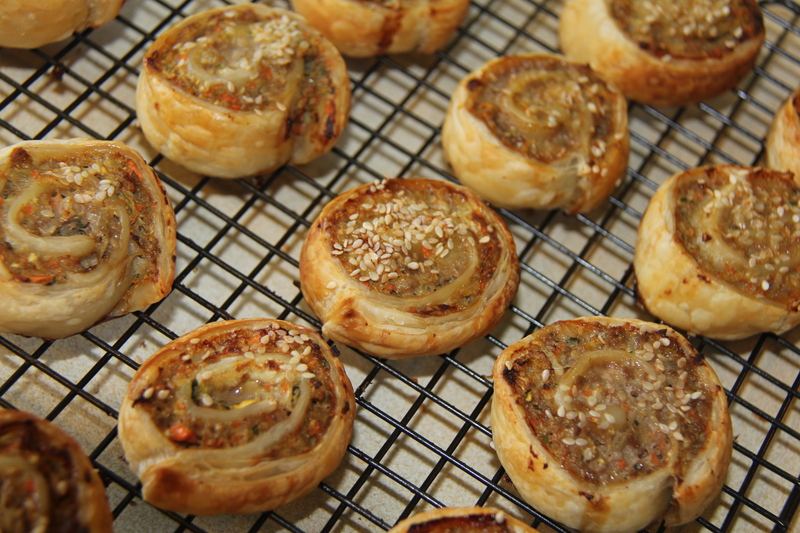 I also made a batch using garlic and chilli flakes which are really yummy. They can be stored in an airtight container for 2-3 days. My friend Claire shared this recipe with me a while back and I finally got around to making them today for lunch. 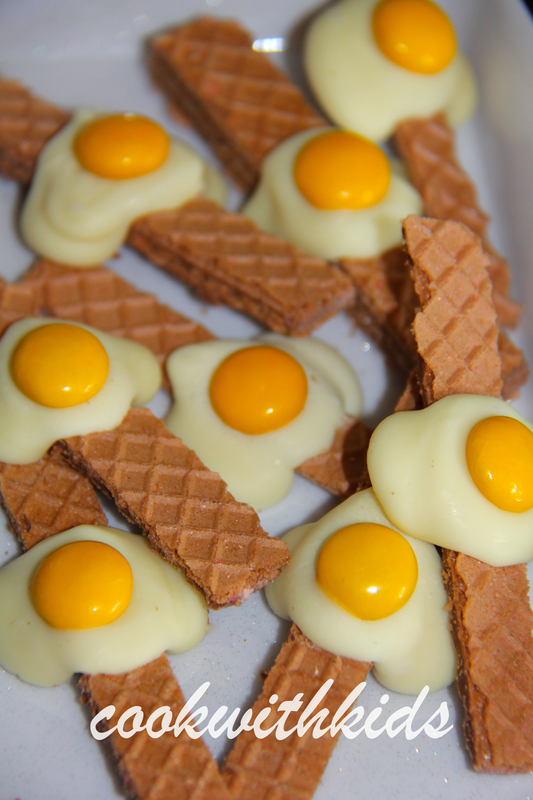 Great simple, easy to make recipe and a winner with the kids (and Daddy). Thomas is needing a bit more of a challenge in the kitchen these days and really enjoyed spreading the vegemite. I gave him a butter knife to use and he did really well (with a little guidance). There were a few chunks out here and there :-). 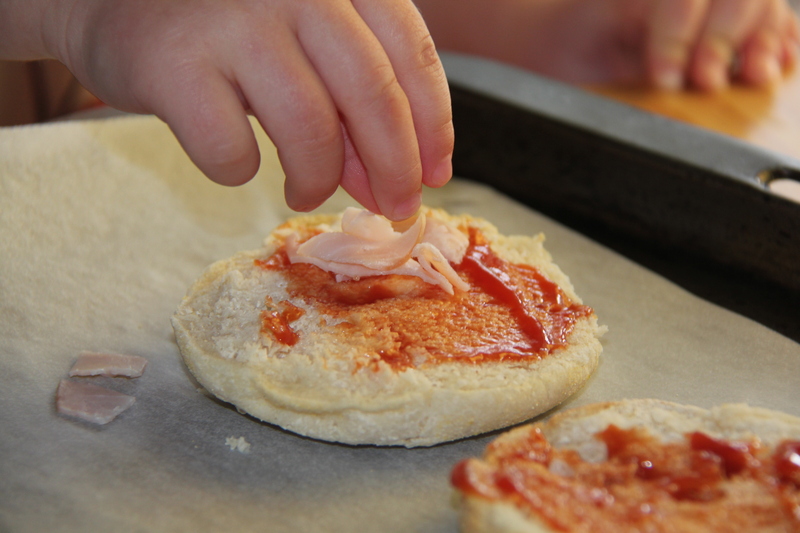 The activity of spreading something onto bread etc is a great way to develop children’s bi-lateral co-ordination. This is where you are using both sides of your body to perform different tasks ie. holding the dough with one hand and spreading the vegemite with the other. Activities like making sandwiches, washing the dishes, cutting with scissors and threading can also be helpful in developing this skill. Thomas really enjoyed watching the colour transformation too as he spread the vegemite and the dough went from white to brown. He commented “its getting darker”. Line baking tray with baking paper or grease. Tip dough out onto a lightly floured bench top and roll out into a 30 x 45cm rectangle, approximately 5mm thickness. Spread generously with Vegemite and top with the grated cheese. 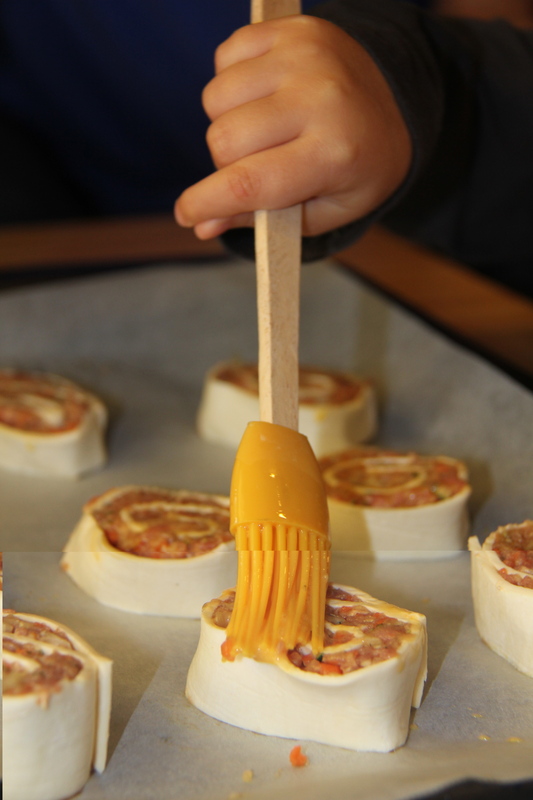 Roll in to a log shape and cut into 2cm slices and place side by side onto a greased or lined oven tray. Bake for 15-18 minutes, or until golden. Serve warm or at room temperature. 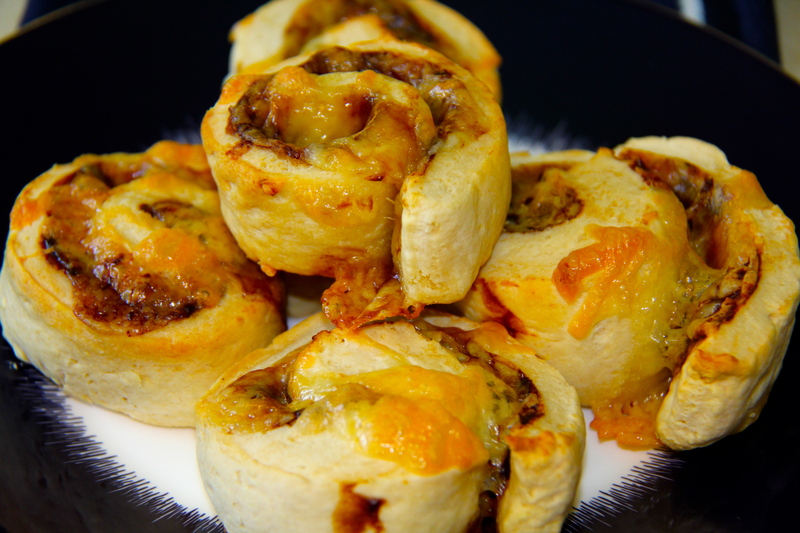 This is a very versatile recipe, use the dough mixture to create your own scrolls… pesto and cheese, pizza scrolls, I used some olive pickles that I had in the fridge. Be creative and enjoy! Very easy and very enjoyable, a great lunch or dinner or even an afternoon snack… You can be creative and use toppings that your children enjoy (and maybe add a couple of new tastes in there too – Thomas hadn’t tried pineapple before today). Thomas and his friend had a great time making pizzas together for their lunch today. 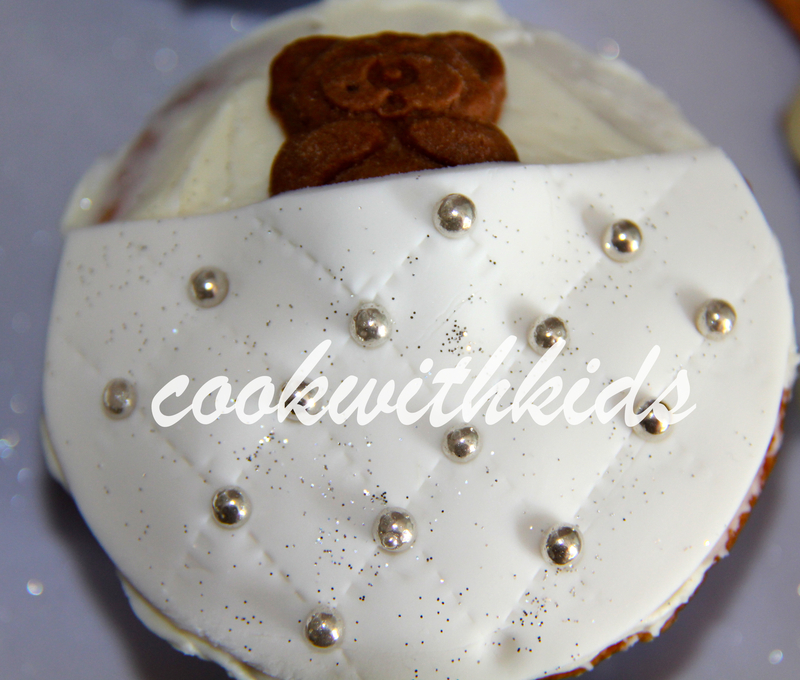 Sprinkling toppings on is good for children’s hand eye co-ordination and also for fine motor skills. 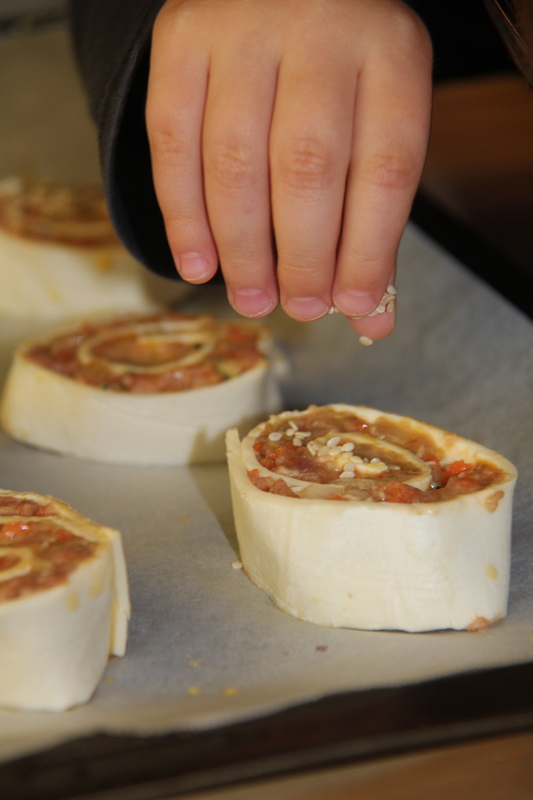 Older children could help with the preparation by cutting up some of the ingredients. Making pizzas also develops children’s sense of independence and decision making skills. They have control over what they put on the pizza and therefore are more likely to eat it. 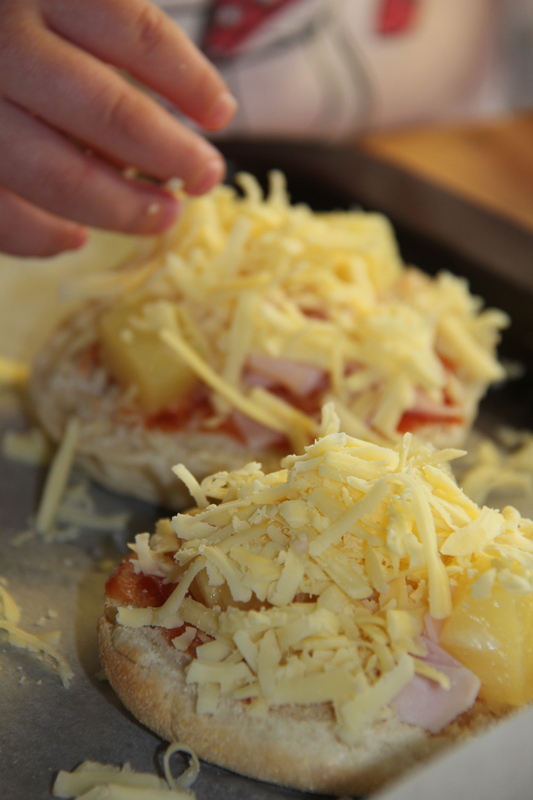 Toppings of your choice – we started with the basics ham, pineapple and cheese. Chop your ingredients into small pieces and put in individual bowls so children can make the choice of what they’d like to put on their pizzas. Using a butter knife, help your child spread some sauce over each of the muffins. 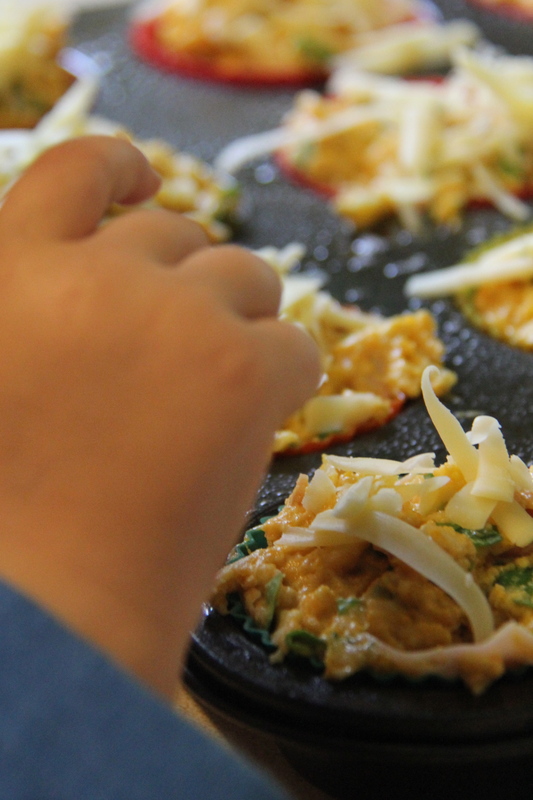 Show your child how to put the toppings on and then let them create their own pizzas. Finish by sprinkling some cheese and put in oven for approximately 10-15 minutes or until cheese has melted. Eat while still warm… YUM! When I first tasted these muffins I wasn’t fussed (neither was Thomas) but they do grow on you with more bites… They are actually quite good. 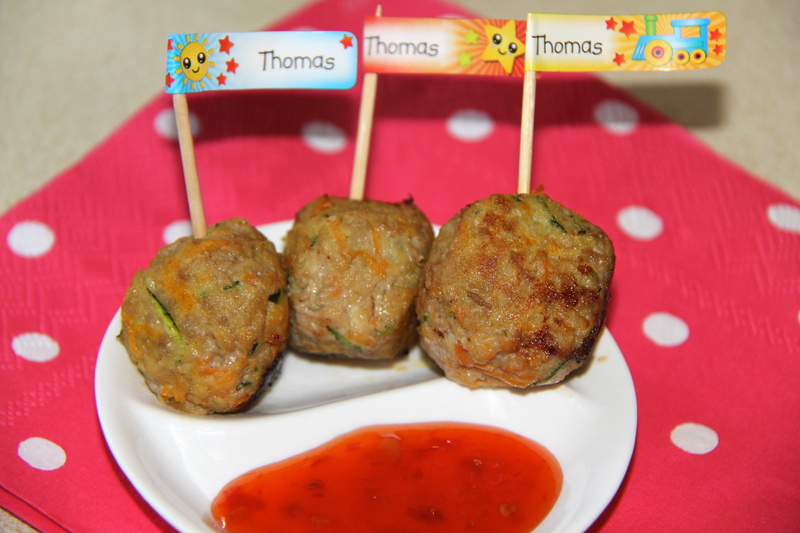 I think Thomas was expecting his usual carrot and zucchini muffins – always good to mix things up! I always have leftover pumpkin in the fridge which inevitably gets thrown out so I thought these muffins might be a good way to use it up rather than throw it out. The recipe was one that I found on the internet a long time ago (not sure where) and I just added a few things to it. Bake for 20-25 minutes until golden (or until skewer inserted into middle comes out clean). Can be frozen and defrosted in the microwave or lunch box.